"the quantity of heat transmitted through a unit thickness of a material - in a direction normal to a surface of unit area - due to a unit temperature gradient under steady state conditions"
The SI unit used for thermal conductivity is [W/m K], while a common Imperial unit is [Btu/h ft °F]. 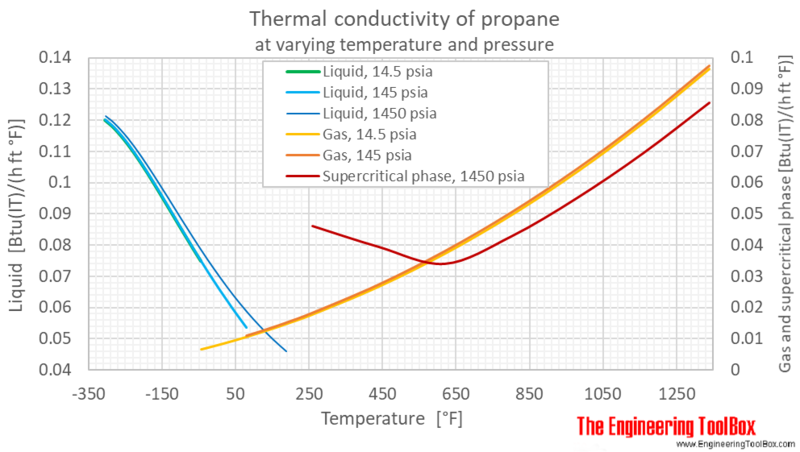 The thermal conductivity of propane depends on temperature and pressure as shown in the figures and tables below. The calculator below can be used to estimate the thermal conductivity of propane at given temperature and atmospheric pressure. Note! Propane boiling point at atmospheric pressure is -42 °C (-44°F), and hence, there is a shift in conductivity at that temperature. The output thermal conductivity is given as mW/(m K), Btu(IT)/(h ft °F), (Btu(IT) in)/(h ft2 °F) and kcal(IT)/(h m K). as well as thermal conductivity of air, ammonia, butane, carbon dioxide, ethane, ethylene, hydrogen, methane, nitrogen and water. For thermal conductivity of construction materials, see related documents at the bottom of the page. For full table with Thermal Conductivity - rotate the screen! Engineering ToolBox, (2018). 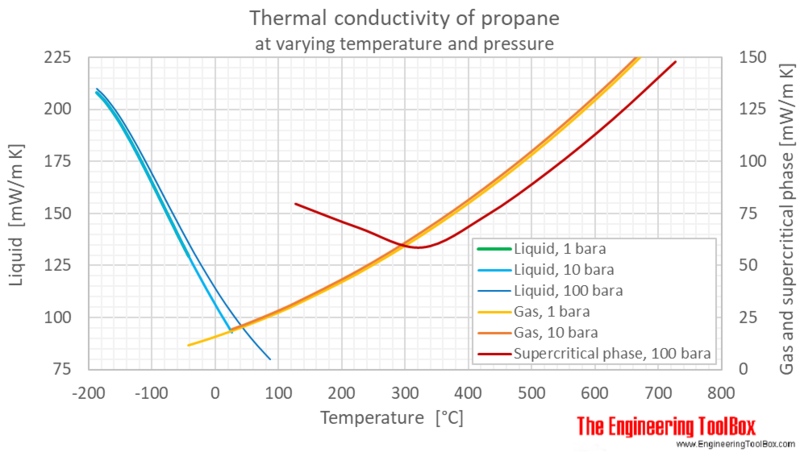 Propane - Thermal Conductivity. [online] Available at: https://www.engineeringtoolbox.com/Propane-C3H8-thermal-conductivity-temperature-pressure-d_2063.html [Accessed Day Mo. Year].